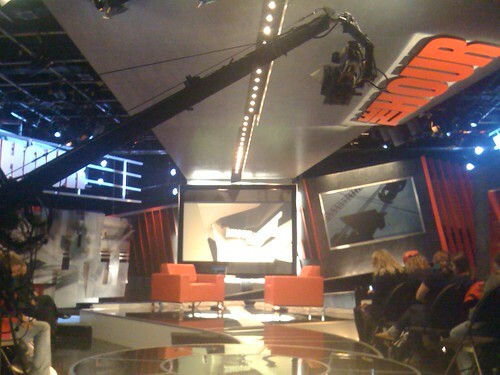 A couple of hours ago I had the pleasure of spending time in CBC studio 43 watching a live taping of The Hour hosted by George Stroumboulopoulos with a good friend of mine. His guests included Taylor Branch author of The Clinton Tapes, David Jacobson US ambassador to Canada and Battle of the Blades team Tie Domi and Christine Hough-Sweeney. George first interviewed Taylor Branch who was a friend, transcriber and sometimes unofficial therapist to President Clinton during his tenor in office from 1993-2001. In Clinton’s eight years as President, the two men would quietly escape to a private section of the White House usually late a night. It was there that President Clinton would answer questions and tell stories about his presidency. Taylor recorded seven nine of these intense and sometimes unpredictable dialogues to compile a memoir for the gifted and resilient former President of the United States. One of the most memorable stories he recounted was when George asked Taylor about how President Clinton was as a father. In a tense session on the night of the Oklahoma City bombing in 1995, Taylor recalled, President Clinton’s daughter Chelsea sought advice for a homework essay on the character Dr. Frankenstein in Mary Shelley’s novel. In the midst of catastrophe the President of a nation did what every great parent would do, put everything on hold for their kids. He read Chelsea’s essay out loud, offered his daughter some assistance in her composition and reassured her she was doing a great job. David Jacobson was up next. In his interview he talked about one of the most memorable nights in US history. It was almost one year ago to the day when he was with the new President-elect Barack Obama. He discussed, among other things, his role as US Ambassor and his relationship with the current US President. George probed him for some insider information and asked him what President Obama was really like. David responded by simply saying he’s the real deal; the same person behind the scenes as his is in the public eye. After a short, fun interview with Tie Domi and Christine Hough-Sweeney and recording had wrapped I asked George how he got his job as host of The Hour. He said, after working at Much Music (Canada’s version of MTV) for several years he wanted to try something different. CBC television had a time slot available but no show. They asked him if he would create a show to put in the time slot. After rejecting them four times for fear that the government owned television station (CBC) wouldn’t allow him to have creative control George finally agreed. George’s manager suggested he had nothing to lose thinking his show would be lucky to last a month. So George took his creative team and spent two days in a pool hall and created the show. Five years later the show is still going strong. I believe that much of the show’s success can be attributed to one of the core values Clinton and Obama embody – Keeping it real.